With so many people constantly using social networks every minute of the day, social media optimization (SMO) is becoming the key to successful digital marketing. SMO is the perfect union of search engine optimization and social media. Businesses are making wonderful use of this opportunity by increasing their brand or product awareness using these social media channels and communities. By creating interesting content that is spread across social media, these businesses target a large audience of potential customers. Early in 2000's, social media was a talk among the young only. But later it became a hub of activity for all ages of people. Marketers saw it as an amazing opportunity to attract traffic to their business website and create their brand awareness. By taking the benefit of social media sites, video sites as well as RSS feed, bookmarking sites and blogging sites to market your brand will increase the appearance of your social media profile in search engines and drive more traffic to your website from social media platforms. Businesses need to make sure that their website or blog display's content attractively when shared on social media. 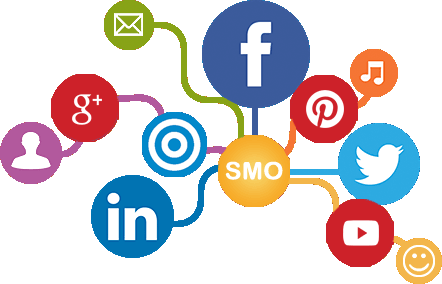 For this you need to connect with the Top social media optimization (SMO) company in India. Aakruti Solutions is the best Social media optimization (SMO) company in Hyderabad that offers unique digital marketing solutions to cater to your specific needs. SMO can be described as something of a subcategory of search engine optimization (SEO), a process in which webmasters optimize their websites to achieve better search rankings. Since 2010, search engines have increasingly prioritized results from social media sites like Facebook, Reddit, Tumblr, Twitter, YouTube and more. With more and more people indulging on social network such as Twitter, Google+ and Facebook, you can increase your brand exposure and leads. At Aakruti Solutions based in India we offer transcendent SMO services to make your online business name popular. Since search engines are usually using social search results to get information for users, it becomes significant that companies should focus on boosting their social media visibility. As one of the Best internet marketing company in Hyderabad, we help our clients gain attention and active leads on social media platforms. Merely creating an online presence by creating social media pages and listing the organization on various social media sites is not enough. The purpose of a Top Social Media Optimization (SMO) company in India is to help build audience base for the business on the social media platform. While we might be able to create our social media page and list ourselves on a social media platform, it requires an expert social media agency like Aakruti Solutions to create awareness and bring the traffic of audience to the social media pages of your organization. Irrespective of what business you deal in or how big or small your organization is our social media marketing service give 100 percent higher positive leads towards active sales. A Top internet marketing company in Hyderabad, like us will allow you to detect new business opportunities by optimizing your website on various social media sites. No individual is unknown to the presence of Facebook and other social media like Instagram, LinkedIn, Twitter or variuos others. Promoting your content, products or services on social networking site like Facebook is what we do best, as we are one of the Best Facebook marketing company in Hyderabad. We are the best Social media optimization (SMO) company in Hyderabad, That offers unique digital marketing solutions to cater to your specific needs. Our team of expert professionals will help you create successful SMO strategies to ensure your content reaches your target market. Our professionals have designed social media strategies for a variety of businesses, ranging from small to large-scale companies. Being digitally present is no longer an option of any business; it is necessary to survive. If you don’t have the experience or the time to achieve it, we, the Best online marketing company in Hyderabad can come to your rescue. Having the right social media networking strategies is very important as through these networking sites people are getting to know brands, companies, products and much more that is going on in the world. So if you are looking for an active social media presence then Aakruti Solutions is the right stop for you as it is the Best digital marketing company in Hyderabad. We deliver affordable digital marketing solutions and provide support for your queries by our experts.